Diversity and abundance of zooplankton of Jebba Upper Basin, Nigeria, were studied between March and May 2015. Three stations were selected and sampled monthly and investigated for zooplankton community structure using basic measurement of diversity for qualitative and quantitative samples to characterize the zooplankton fauna. The zooplanktons were present throughout the sampling period in the month of May with average abundance of 108 individuals/10 ml. The high abundance of individuals was also recorded in March but higher in the month of May. A total number of 658 individuals of zooplanktons were enumerated from the samples. The most evenly distributed is cladocera which represented 40.58% of the total population of zooplankton, though most abundant zooplankton is copepoda (41.19%) while Rotifer is the most diverse in terms of species representation. The zooplankton abundance followed the order copepoda>cladocera>rotifer. The zooplankton community of Jebba Upper Basin dominating and characterized by the species indicate good ecological condition of the river. Zooplankton, which are all those mixed group of tiny, living animals that float, drift freely or feebly swim in water column independent of the shore and bottom (Sommer, 1994) and occupy the base level of food chains that lead up to commercially important fisheries have severally been used as bio indicators of water quality (Keller et al., 2004). Additionally, Zooplankton as a biotic component of the aquatic ecosystems play a key role in cycling of organic materials, helping in regulating algal and microbial productivity through grazing, as suspension feeders and predators in the transfer of primary productivity to fish and other consumers (Dejen et al., 2004). They serve as food for fish fry, fingerlings and other aquatic organisms. The zooplankton plays a major role in "Food web" of any aquatic ecosystem and could be induced or adversely affected by any of the environmental factors. They often exhibit dramatic changes in response to the changes in the physico-chemical and biotic properties of the aquatic environment hence are good bioindicators for the assessment of trophic state of water (Vilela et al., 2003; Paturej and Goździejewska, 2005; Imoobe and Adeyinka, 2010). Zooplankton is ideal for theoretical and experimental population ecology due to their small sizes, short generation time and a relatively homogenous habit. Its communities of fresh water bodies constitute an extremely diverse assemblage of organisms represented by most of the invertebrate phyla, however, the dominant zooplankton includes rotifers, cladocerans, copepods and ostracods and their distribution and diversity are influenced by seasonal variations of physicochemical properties, biotic factors including feeding ecology and predation pressure (Egborge, 1994). Despite the importance of zooplankton organisms in Nigerian water bodies, many man-made Lakes in Nigeria have not received broad attention in the study of their zooplankton community and there is need for more basic limnological information on some of these Lakes. Such information will act as basis for better understanding of the trophic interaction between aquatic organisms and serve as baseline information for assessing their biodiversities and abundance. Therefore, this study assesses the zooplankton structure in Jebba Lake Upper Basin in relation to its composition and abundance to help in planning and successful fishery management of the area. The Jebba Upper Basin was dammed to create Jebba Lake in August 1983 as part of a hydroelectric scheme. The basin extends from the dam site at Jebba to southern tip of the Kainji dam at Kainji. The lake is therefore unique as the first and the only man-made lake in Nigeria that has a direct flow from another man-made lake located upstream to it. It is located in the northern hemisphere between latitudes 9°0'N and 9°55'N and longitudes 4°30'N and 5°00'E. Its tributaries include the Awun, Eku, Moshi and Oli rivers. It falls within the savanna zone, but specifically Guinea savanna (KLRI, 1983). Three sampling stations were selected: an upstream, a midstream, and a downstream station. Station 1 is located upstream approximately 8 km from a hydroelectric power plant. The substratum is clay, mud, and decaying plant matter. A major portion of the substratum is covered with stones, but the bank area is sandy. Sampling station A is surrounded by trees of Vitellaria paradoxa, Anacardium spp., and has not very clear water and the bottom having fewer decaying plant matter. Human activities near station A include farming, fishing, washing, and bathing. Station B is about 2 km downstream of Station A, at the basin confluence with the Oli River. Apart from deposited major anthropogenic wastes, including animal faeces and urine, mining effluent, agriculture runoff, domestic waste, the major human activity at this station is fishing. Station C is further downstream 2 km from Station B. The vegetation is mainly seaweed and guinea grass in this area. There is no human activity near Station C except for animal grazing. Samples were collected between 08:00 and 11:00 h between March and May 2015 from Station A and progressed downstream to Station C. Qualitative plankton samples were collected by towing 55 μm mesh hydrobios plankton net just below the water surface for five minutes at each sampling station. Quantitative samples were collected by filtering 100 L of water a 55 μm mesh hydrobios net. Both samples were preserved separately in 4% buffered formalin solution (Table 1). In the laboratory, specimens were sorted and dissected where necessary under a binocular dissecting microscope. Identification of specimens was carried out in the Limnology Laboratory at the National Institute of Freshwater Fisheries Research (NIFFR), New Bussa, Nigeria, using relevant literature (Smirnov, 1974; Van de Velde, 1984; Imoobe, 1997; Korinek, 1999). The percentage relative abundance of specimens was estimated by direct count. Each quantitative sample was concentrated to 10 ml and from this 1 ml samples were taken and all individual zooplankton counted. Relative abundance was calculated as the number of individuals per litre of water filtered through the net. Species diversity indices were constructed to analyze the zooplankton community structure. A total of 658 individuals of zooplanktons were enumerated from the samples. The most evenly distributed is Cladocera which represented 40.58% of the total population of zooplankton, though most abundant zooplankton is Copepoda (41.19%) while Rotifer is the most diverse in terms of species representation. The zooplankton abundance followed the order copepod >cladocera >rotifer. The zooplanktons were present throughout the sampling period in the month of May with average abundance of 108 individuals/10 ml. The high abundance of individuals was also recorded in March but higher in the month of May. In the month of April, the abundances were comparatively reduced (Figures 1 and 2). Figure 1: Map of the study areas on Jebba Upper Basin. The sampling stations are marked A, B and C, respectively. 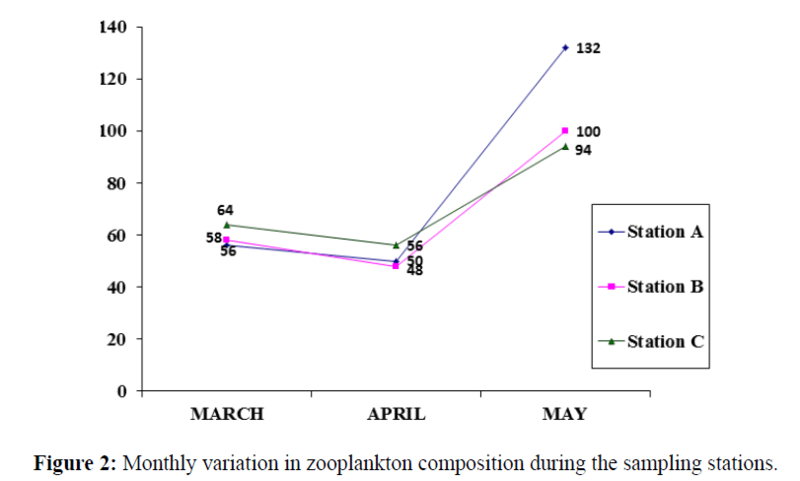 Figure 2: Monthly variation in zooplankton composition during the sampling stations. All the nineteen species of zooplankton fauna repeated in this study consisting of 11 rotifers, 6 cladocera and 3 copepods are common occurrence in several other river (Imoobe et al., 2008; Imoobe and Akoma, 2009; Imoobe and Adeyinka, 2010; Lazo et al., 2009). Distribution of cladocera were high across all the station though vary among sampling station under serious pollution suggest that the river is not present under serious pollution threat. The dominant status of rotifer species in rivers comparative to the cladoceras and copepods is characteristic of tropical lakes and rivers and this has been reported in the studies of (Neves et al., 2003 and Mwebaza-Nadwula et al., 2005). In particular, Edema et al. (2002) had reported that numerically. The rotifers constituted higher percentage in the studies of the zooplankton and macro benthos of the Jebba Lake. As espoused in the work of Imoobe and Adeyinka (2010) the dominance of smaller zooplankton species in this case rotifers in rivers may possibly be due to predation pressure from plankton ivories fishes that selectively prey on larger sized zooplankton (Carpenter et al., 1985) zooplankton abundance and species number in Jebba Upper Basin varied monthly. Monthly alteration of zooplankton abundance which was apparent in this study may be due to the physical-chemical condition of the water flooding during the rainy season which may have contributed positively to zooplankton population growth as a result of species recruitment from other flooded water bodies and the inflow of nutrients from the drainage basin that will trigger off increase in phytoplankton production and consequently zooplankton productivity however dynamics of zooplankton communities in the tropics has been attributed to a number of other factors such as the environmental characteristics of the water, predation, quantity of edible algae and competition (Hellawell, 1986; Ovie and Adeniji 1994). The zooplankton community of Jebba Upper Basin dominating and characterized by species indicate good ecological condition of the river. The diversity of zooplankton in the study area will enhance fish production especially for planktonvorous fish. However, it is the then necessary that human activities should be controlled in the study area to avert the pollution treat, which will consequently affect the primary productivity of the basin. Carpenter, S., Kitchell, J. and Hodgson, J. 1985. Cascading trophic interactions and lake productivity. Bio. Sci. 35: 634-638. Dejen, E., Vijverberg, J., Nagelkerke, L. and Sibbing, F., 2004. Temporal and spatial distribution of microcrustacean zooplankton in relation to turbidity and other environmental factors in large tropical lake (L. Tana, Ethiopia). Hydrobiologia 513: 39-49. Edema, E.U., Ayeni, J.O. and Aruoture, A. 2002. Some observations on the zooplankton and macrobenthos of the Okhuo River, Nigeria. J. Aquat. Sci., 7: 145-149. Egborge, A.B.M., 1994. Salinity and the distribution of rotifers in the Lagos Harbour-Badagry creek system, Nigeria. Hydrobiologia, 272: 95-104. Hellawell, J. 1986. Biological Indicators of Freshwater Pollution and Environmental Management. Elsevier, London. Imoobe, T. O. T. 1997. Crustaceans of the Jamieson River (Nigeria), 155 pp. Ph. D. Thesis, University of Benin, Benin City, Nigeria. Imoobe, T. O. T., and Adeyinka M. L., 2010. Zooplankton-based assessment of the trophic state of a tropical forest river. International Journal of Fisheries and Aquaculture Vol. 2(2): 64-70. Imoobe, T. O. T., and Akoma O. C. 2009. Spatial variations in the composition and abundance of zooplankton in the Bahir Dar Gulf of Lake Tana, Ethiopia. Afr. J. Ecol., 48: 72–77. Kainji Lake Research Institute, K.L.R.I. 1983: Pre - impoundment studies of Jebba Lake. Kainji Lake Research Institute, New - Bussa, Nigeria. P.86. Keller, B.; J Wolinska; M Manka; P Spaak. 2008. Philosophical Transactions of the Royal Society B: Biological Sci 363: 2943-2952. Korinek, V. 1999. A Guide to Limnetic Species of Cladocera of African Inland Waters (Crustacea, Branchiopoda). Occasional Publication No. 1. The International Association of Theoretical and Applied Limnology, BTL, Geneva. Lazo M. A. V. A., Nieto, K. K. P., Rayel, M. F.S., Domingo, D. M. S., Vergara, M. A. M. and Papa, R. D. S. 2009. Composition, Abundance and Distribution of Rotifers in the Pasig River, Philippines. Philipp. Scient. 46: 47–64. Mwebaza-Nadwula, L., Sekiranda, S.B.K. and Kiggundu. V. 2005. Variability in zooplankton community along a section of the Upper Victoria Nile, Uganda. Afr. J.Ecol. 43: 251-257. Neves, I.F., Rocha, O., Roche, K.F. and Pinto, A.A. 2003. Zooplankton community structure of two marginal lakes of the river Cuibá (Mato Grosso, Brazil) with analysis of Rotifera and Cladocera diversity. Braz. J. Biol., 63:329-343. Ovie, S.I and Adeniji. H.A. 1994. Zooplankton and environmental characteristics of Shiroro Lake at the extremes of its hydrological cycle. Hydrobiologia 286: 175-182. Paturej E. and Goździejewska, A., 2005. Zooplankton-based assessment of the trophic state of three coastal lakes – Łebsko, Gardno, and Jamno. The Bulletin of the Sea Fisheries Institute 3 (166): 7 – 25. Smirnov, N. N. 1974. Fauna of the USSR, Crustacea, Vol. 1, No. 2, Chydoridae, 644 pp. Academy of Sciences of the USSR (English translation, Israel Program of Scientific Translation, Jerusalem). Sommer. U. 1994. Planktologie. Springer, pp: 274. Van De Velde, I. 1984. Revision of the African species of the genus Mesocyclops Sars, 1914 (Copepoda; Cyclopidae). Hydrobiologia 109: 3-66. Vilela, C.G, Sanjinés A.E.S, Ghiselli Jr., R.O, Filho J.G., Neto, J.A., Barbosa, C.F. 2003. Search for Bioindicators of Pollution in the Guanabara Bay: Intergrations of Ecologic Patterns. Anuário Do Intituto De Geociências 26: 25–35.